UPDATE (12/14/18): 5219 is retired from service. 28 New Gillig buses will arrive in Spring 2019. UPDATE (12/14/18): 5219 is retired from service. Milwaukee County Transit System Older New Flyer D40LF buses left in service as Nov. 21, 2018. 4735, 4740, 4742, 4744, 4746 (5) 4801, 4803, 4804, 4808, 4810, 4817-4819, 4822-4825, 4827-4829 (15) 4900-4906, 4908-4914 (14) 5000-5007 (8) Seen at the shops and in storage. 4718, 4750, 4806, 4811, 4813 & 4821 4907 is retired for good after that mishap back in September. The following are off the property and disposed. 4305, 4320, 4616, 4636, 4638, 4700, 4701, 4702, 4703, 4704, 4706, 4707, 4708, 4709, 4710, 4711, 4717, 4719, 4720, 4728, 4729, 4730, 4731, 4732, 4733, 4734, 4736, 4737, 4739, 4741, 4743, 4745, 4747, 4748, 4749, 4800, 4802, 4805, 4807, 4809, 4812, 4820, 4826. The new Gillig 5900's will arrive in Spring 2019. This order will wipe out the remaining 4700's, most of the 4800's and a few 4900's & 5000's. More service cuts will occur after the 2018-2019 school year is out and that will put more D40LFs in storage for either ready reserve or retirement. Can update the Wiki page. That's my last post for 2018. Wish all the CPTDB staff and all the viewers a Merry Christmas and a Happy New Year. P.S. Here's a nice photo of model Milwaukee GM bus at the Trainfest 2018. Seen Badger Coaches 302 & 307 at General Mitchell International Airport. All 2018 VanHool. Photos will be provided on a later date. Seen the 302 on W. Grange Ave. at S. Howell Ave. on Tuesday November 13, 2018 and on charter work. Seen the 307 on the Baggage Claim Outer Drive Bus Area on Thursday November 15, 2018 and on the Milwaukee & Madison assignment. In the last month or so, 262, 263 & 266 are in plain red. The graphics had been removed. My guess that these coaches are likely being phased out. Photo of 262 in plain red at General Mitchell International Airport Baggage Claim Outer Drive Bus Area and assigned to Milwaukee & Madison run on Wednesday October 31, 2018. Bus History Association did visit Badger Coaches in Madison a couple of years ago. Can add to the Wiki. 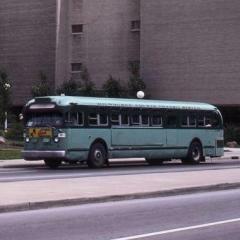 Milwaukee County Transit System 4907 is retired. It had a mishap and the right front is damaged. Kenosha Streetcar 4615 Painted in the Johnstown orange and cream. Out on display at the Joseph McCarthy Transit Center and Streetcar Yard for the 2018 Kenosha Streetcar Appreciation Day. Still out of service at this time. NOTE: Glad to see it outside after spending 3 years inside the barn. Taken on Saturday September 15, 2018 via my cell phone. Can add to the Wiki. The Kenosha Streetcar Roster is now complete. Follow-up on the new buses Valley Transit 1701 & 1702 were spotted at the transit center on Tuesday August 21. Both photos taken via my cell phone. Very nice paint scheme on these buses. Welcome to add to the Wiki. Milwaukee County Transit System 4818 On N. 5th St. at W. St. Paul Ave. in Downtown Milwaukee. Assigned to Route 12 (Teutonia-Hampton) and on its way to Milwaukee's far north side. Taken on Friday August 17, 2018 via my cell phone. Can add to the Wiki As Sunday August 26, 2018. Fiebrantz Garage will be closed and Routes 6, 12, 42U, 49U, 63, 76, 143, 276 and the handful of runs on Route 67 will be shifted to Fond du Lac Garage. All buses and employees will be reassigned to Fond du Lac. This will forever leave 2 garages. Fond du Lac on the north side and Kinnickinnic on the south side. The reason is budget cuts. 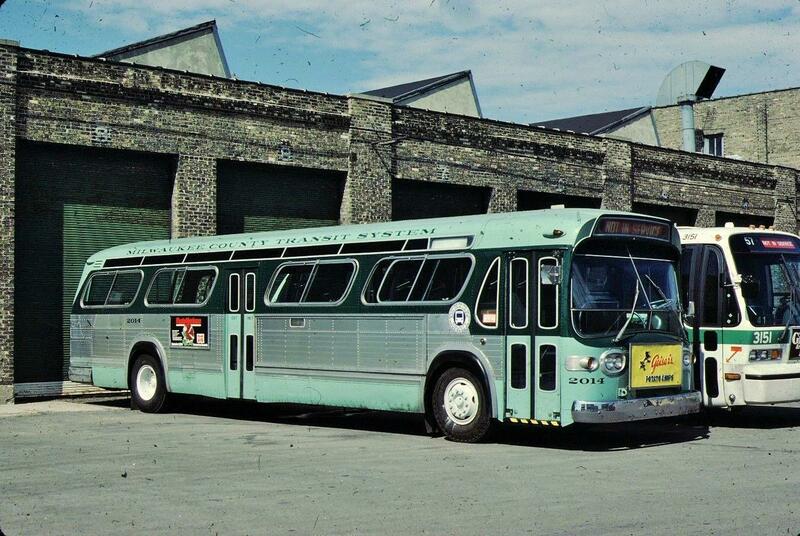 Milwaukee once had 7 bus garages (then Car Barns) before 1955. Fiebrantz Garage opened in 1930 and housed streetcars, trackless trolleys, gas & diesel buses and all were parked outside. In 1968, a garage was built and renovated in the late 1980's to bring it up to standards. Unknown what will happen to the garage after its closure. Milwaukee County Transit System 5141 is fully wrapped for the Milwaukee Brewers Baseball. On E. Juneau Ave. between N. Jackson St. & N. Milwaukee St. Assigned to Route 15 (Holton-Kinnickinnic). Taken on Wednesday August 8, 2018 in the late afternoon. Too bad that I can't charter a transit bus for a few hours to get photos on nice backgrounds. Milwaukee County Transit System 5000 On W. Wisconsin Ave. at N. 6th St. in Downtown Milwaukee and assigned to Gold Line (Wisconsin Ave.) on its way to UWM. The 5000's were the last order of D40LF's for Milwaukee and delivered in early 2006. About 50 left in service. Taken on Wednesday August 8, 2018 via my cell phone. Can add to the Wiki. GO Transit (Oshkosh, WI) have new buses. GO Transit 1809 at the transit center. It's a 2018 New Flyer Xcelsior and guessing a hybrid. I'll get back to Oshkosh on later time. The older New Flyer buses are still hanging around. The Bus History Association were in Oshkosh to view the older New Flyer buses at the transit center 2 years ago. Taken on Saturday July 28, 2018 via my cell phone. Can add to the Wiki. Valley Transit (Appleton, WI) have new buses. Seen #1703 on Route 30 in Menasha (outside Appleton) on Saturday July 28. It's a New Flyer Xcelsior 40 foot bus. I'll get a photo along the way. I wouldn't be surprised if the Orion V's are all retired now. The Bus History Association were there to see one on display at the transit center 2 years ago. UPDATE (8/17/18): 5219 is out of service and no further details at this time. There is a YouTube video of the bus being towed. Search "MCTS Crash May 15". Here are two YouTube videos of the May 15 accident as it happened. The full screen is from WISN 12 News and the multiple views by MCTS WARNING: Very graphic video. Follow-up from MCTS Website Update on Investigation into Accident at 12th and Wisconsin July 27, 2018 Milwaukee, WI – The investigation into a May 15th bus accident at 12th and Wisconsin has wrapped up. The investigation shows that Calvert Campbell, the bus driver, failed to apply the brake and instead accidently accelerated through the intersection and into a Marquette University building. Five passengers were on the bus at the time of the accident. Campbell and three passengers reported injuries that were not life threatening. 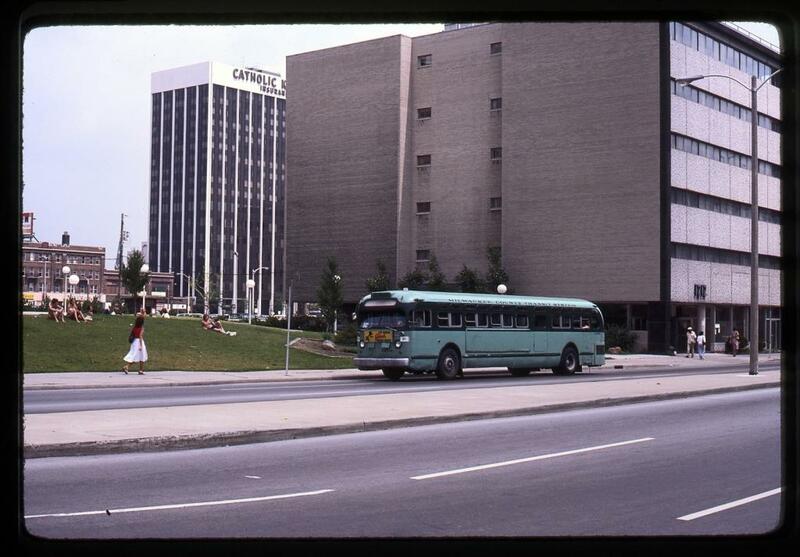 MCTS and an independent engineer performed an extensive review of the bus. They looked at bus brakes, the engine and service records and found everything was working properly. Jeff Peterson, the independent engineer from Skogen Engineering Group, found: “No mechanical defects were found during our inspection of the bus that pre-existed the accident.” Further evidence of the cause was discovered in surveillance video released by Marquette University. The video shows the bus drive through the intersection and into the building without the rear brake lights ever illuminating. Prior to this accident, Campbell, 59, drove for 12 years without any accidents. Campbell is being taken off the road for at least six months. During that time, he will be part of the team that cleans the buses at night and fills them up with fuel. He will not drive any routes or any buses in service. At the end of six months, he will be reevaluated.